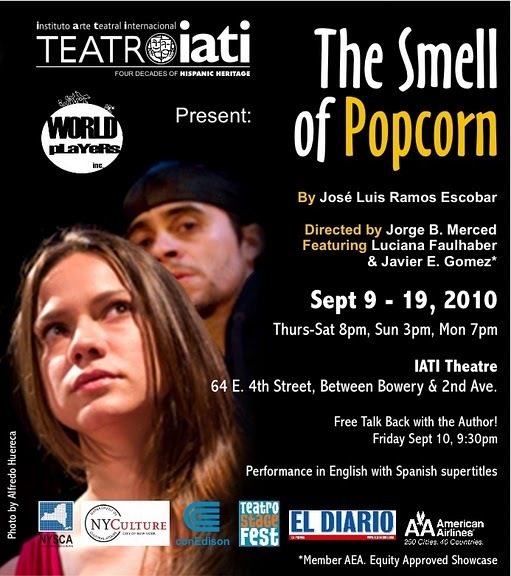 Be sure to catch Luciana Faulhaber as “Fabiola” & Javier E. Gomez as “Georgie” in Jose Luis Ramos-Escobar’s “The Smell of Popcorn” at Teatro IATI (59-61 East 4th Street in NYC). A native of Brazil, Luciana is an actress on the rise! 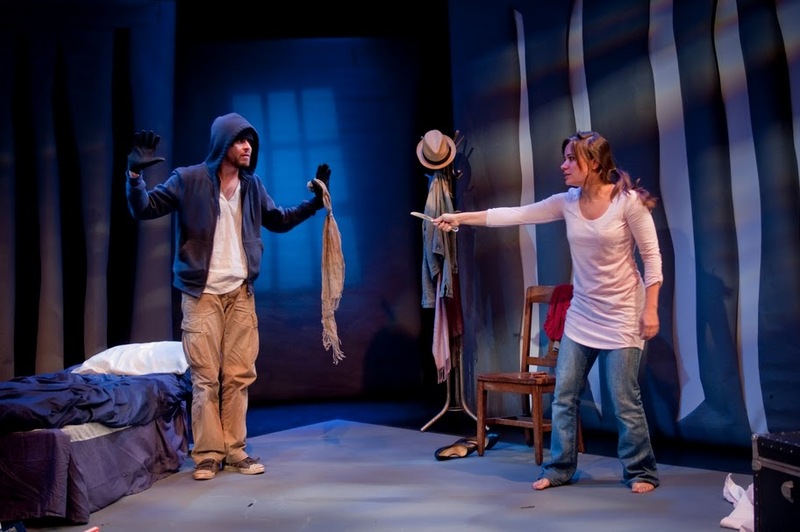 She completed a two-year Meisner training with Bill Esper adn the LABryinth Theatre Master Class. Her theatrical credits include many Off-Broadway and Off-Off-Broadway productions such as John Patrick Shanley’s new musical “The Monkey Show,” a staged reading with LAB theatre, “I rise in Flame Cried the Phoenix,” at TEEN 99, “Don’t hold the Doors” at Bleecker Street Theatre, “Seascape with Sharks” and “Dancer” at The Tank, “One” at Nic’s Spoon Theatre, Joleen in B.F.F. finalist at the From the Hip: Horror festival, “The Goose is Getting Fat” finalist of Kick IT! 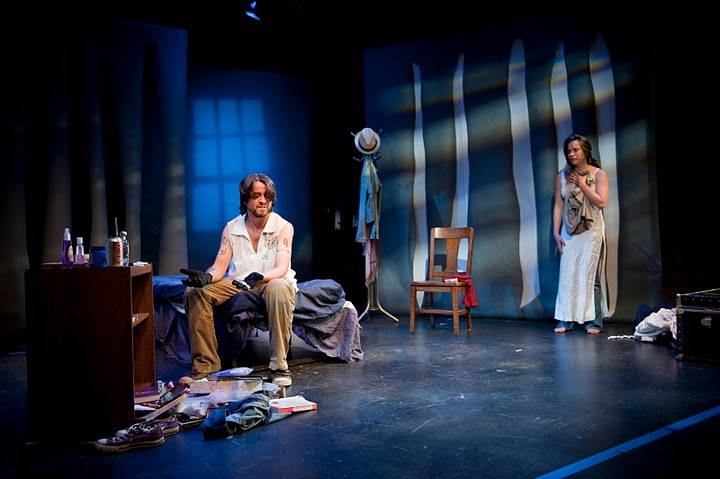 Festival, “Romeo and Juliet Together” and “Alive at Last!” at Long Beach Playhouse, CA. Her film credits include “The Winning Season,” “Una calle Sin Salida,” “Lottery Ticket,” and “The Last Samba.” Luciana has also been featured as a model for Guy Webster, MAC Cosmetics, and has a national AT&T commercial currently running. For much more on Luciana be sure to visit http://www.lucianafaulhaber.com. 1. Who inspired you to become a performer? That’s a tough one. I guess in a twisted way my family did. I come from a traditional one and being an artist was never on top of my mother’s list for me. She wanted me to have a “real job” and live the safe life. I played the good girl role for a while but as they pushed me in that direction the need to act and break free grew stronger, until I did. I guess you can say I am a bit of a rebel. 2. Who is the one person you haven’t worked with that you would like to? There are so many people I’d like to work with that it would be impossible to pick one. But I’ve had the chance to meet wonderful people in the past year that just make me see the world in a whole different level with their art: Sandra Werneck, John P. Shanley, Jose Rivera…I would be lucky to work with them not only cause they are so incredibly talented but because they are wonderful people and that is hard to find. Now if I had to pick another actor to work with, it would be Eli Wallach. He is a legend, sweet and just so adorable! 3. Do you have any rituals that you must do before a show? How do you decompress after a show? Every show is different for me. It really depends on what the character requires. “Fabiola” for example, needs to move to loud music, own the space and grow big before each performance. The only ritual that seems consistent is putting my make up on in the dressing room before every performance. I make sure to arrive at the theatre with an extra half hour, turn on a play list on my iPhone and play with the colors forgetting the world out there. That is the beginning of becoming a new character for me. Now to decompress I go for bike rides. I turn on my favorite sing along tunes, put my doggy Spike Lee in the basket, and just ride. The evenings are my favorite since the city is quieter and cooler. It just makes me happy. 4. If you couldn’t be doing what you are doing now, what career would you choose? Unfortunately this is a one way street for me. I can say I’ve been there and done that. I have tried other careers and life times. I can say with certainty that this is it. 5. Do you have any strange or unusual talent the no one knows about? Nothing I would proudly say in public. But I have one peculiar childhood obsession that grew into an amazing observant talent. I’ll tell you one of these days. 6. Favorite meal? Any meal cooked by my mom at home in Rio de Janeiro, Brazil. The smell of the black beans being cooked or the rising cakes she bakes…it’s all just sweet like childhood and I miss it so much here in NY. But I had a chance to be hosted in Lebanon last year by my beautiful friend Sarah Himadeh and she made sure I tried everything. Since then I have been a huge fan of Lebanese food. 8. Favorite skin care product? I am very concerned with what kind of products I use on my skin since it absorbs almost everything you put on it. I really like “Kiss My Face” moisturizers. They are light in texture, all natural, smell great and give me an excuse to ask for some kisses. Couldn’t be better. 9. Favorite website? Imdb. I love movies and I want to do more film work from here on. So imdb helps me learn more about upcoming projects and the film industry even though it is not always up to date. 10. Superman or Wonder Woman? Wonder Woman! I am all about female empowerment. I learned a lot about my own feminine power by playing “Fabiola” and I wouldn’t trade that for anything. 11. If you could dream about anyone while you sleep, who would it be? I am not doing much sleeping these days…but I’d like to dream about people I am yet to know. Nothing like waking up looking forward to something new. 12. What’s the best advice you’ve ever received? “Whenever you don’t know what to do just smile. People will come to you. Everyone wants to talk to the happy person in the room.” This is advice I got from a girlfriend about dating but I apply it to just everything. Already an award-winning writer, Javier is an up and coming actor rising fast! He too is a graduate of the two-year Meisner program with Bill Esper. 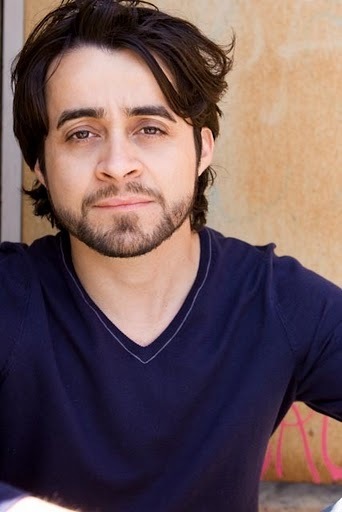 Recently, Javier appeared in “No Dogs Allowed” at the Atlantic Theatre Company. His other theatre credits include “My Favorite Year,” “Rock Horror Show,” Shakespeare’s “Measure for Measure,” “Apathy: The Gen X Musical,” “Lorca Federico,” “Ruandi,” “Paper Boat: Hostos,” Sondheim’s “Passion,” “Threepenny Opera,” “The Wiz,” and “Man of La Mancha.” His film and TV credits include “Guiding Light, ” “Psychosis” (Padre David), a Sunday prime-time series for Telemundo directed by Sonia Valentin, “El Cantante” and “Carlito’s Way: Rise to Power.” Javier is also an award winning writer with works published by “El Diario/La Prensa” (the oldest Spanish language newspaper in the US), “El Nuevo Dia,” “Pie Derecho,” and “Reuter’s Dollars & Sense” magazine. 1. Who inspired you to become a performer? My main inspiration to become a performer was originally self-generated. It came from within me, at a very early age, and there was nothing I could do about it. It was just there. It was an inexplicable drive to perform, and awareness that performing was what I was meant to do. Along the way I have strengthen my inspiration through the encouragement of my family and a dear high school teacher, and the example and legacy of Eleonora Duse, the late actor Raul Juliá, Puerto Rican playwright Rene Marqués, Teatro del Sesenta Theater Collective in San Juan, and director Joseph Papp, among other artists whose work led me to aspire to the same level of commitment and excellence. 2. Who is the one person you haven’t worked with that you would like to? Hal Prince! LOL. Talk about a man whose vision has repeatedly changed the course of theater in this nation! 3. Do you have any rituals that you must do before a show? How do you decompress after a show? Before a show I try to be as relaxed as possible. I usually take some time alone to be in silence, and meditate, and check with myself. Then I go into a voice, movement, and body warm up routine that varies according to what show I am working on. In the case of “The Smell of Popcorn”, such an intense non-stop physical and emotional show, it involves Suzuki, Viewpoint, and military exercises, and beating a punching bag conveniently located inside the theater. After a show, my favorite way to decompress is going home to family for a quiet conversation, and a cup of cereal in cold milk. Except for “The Smell of Popcorn”. After that show I head straight to a bar near the theater for a cheeseburger and beer. 4. If you couldn’t be doing what you are doing now, what career would you choose? I would be Mayor, or Director of Tourism or Cultural Affairs for my hometown in Puerto Rico. I love public service, and I believe that I would be equally content making a contribution there. 5. Do you have any strange or unusual talent that nobody knows about? I have a remarkable ability to remember historical facts, dates, and names. I keep it to myself because the moment I express it in public, people think I am a freak. 6. Favorite meal? Tough choice. I am a huge exotic food junkie, so my favorite meal keeps changing as I discover more foods from around the world. At the moment I am obsessed with tripe soup from Wing Wong Restaurant in Chinatown. For dessert, nothing beats the Tres Leches (Triple Milk Dipped) Cake, Cuban style. 7. Favorite way to stay in shape? Weight lifting and cardiovascular training, combined with eating and sleeping well. 8. Favorite skin care product? Kiehl’s entire line of moisturizers for men. 10. Superman or Wonder Woman? Wonder Woman, of course! 11. If you could dream about anyone while you sleep, who would it be? My father, my grandparents, my great-aunt Tomasa, and all those people whom I adore but sadly passed away too soon in my life. 12. What’s the best advice you’ve ever received? “Create your own circumstance. Don’t let circumstance create you” – Landmark Forum.